On their way to Magic Mountain on Superbowl Sunday. See my beautiful Peach tree in background? Each pink blossom will be fruit. Cobbler anyone? Signs of the times surround me. My blossoming peach tree is a sure sign that spring is around the corner. Sitting thru three basketball games a week watching Daniel is a sign that we’re mid-basketball season. 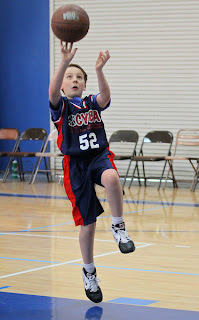 AND, his CYBA team still stands undefeated! The Wildcat’s are "in the zone!" Yes! He made the shot! All wins or losses! There's that impossible balance that touches everything, even youth basketball leagues! Another seasonal marker? The Birthday Sign. This sign reminds me of the birthday stretch that runs from January to March for all my 1968 friends and family. This celebration cycle is in full swing. By pure accident, the sign I made for Uncle Dave in January is getting a full workout. It celebrated friends, Maki and Ayndrea’s birthdays, and on Super bowl Sunday Uncle Lui was honored with this eye-sore-ish, but festive creation. It announced Lui's forty-five years above ground arriving on Febraury 11th! His celebration started after spending the day at Magic Mountain with “the crew” of rollercoaster-crazed peeps. God Bless Aunts and Uncles eveywhere. Oh! The oven timer just when off and that is a sign that my eight-egg casserole is done. I am going out for Italian food with the Women’s Retreat team, which is a relief because I am up to my unicycle seat with egg dishes. My border-high cholesterol is proof! Oh, and my washing machine just signaled it’s time to rotate clothes.